If you’re looking for a an entertaining twist on a community card game such as Texas Hold’em then Iron Cross might fit the bill. It’s probably not particularly suitable for casino play but for home play it’s ideal, as long as everyone understands the rules. Community card poker is a variant in which a number of cards are placed in the centre of the table by the dealer and are shared by all players. The aim of Iron Cross is to create the strongest five card hand according to standard high poker rankings. 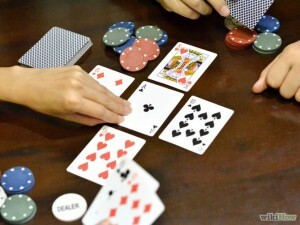 It’s played with antes so each player will place a small bet into the pot before the deal. To start with each player receives five cards face down; the dealer then places the five community cards on the table in the shape of a cross, i.e. one horizontal row of three and one vertical row of three. After each card is revealed there is another betting round; if more than two players are remaining in the game at this point the showdown takes place and cards are compared. Players must comprise at least two from their own hand while those from the community cards must come from the same vertical line or horizontal row.